Bossy Girls, Cranky Ladies, Daughters of Time? The History Girls have blogged about them all. We now have our own anthology, no news to anybody, and I can't resist a bit of a trumpet. I have to admit that when the anthology was first mooted by Mary Hoffman, I couldn't immediately think of any one woman to write about. It was not until later that day, when I was talking to my daughter, Catrin, that an idea began to form. We were talking about suitable candidates and she suggested Emily Wilding Davison, the suffragette who threw herself under the King's horse on Derby Day, 1913. She mentioned the return ticket to Epsom that Emily had about her person and suddenly a story began to form. 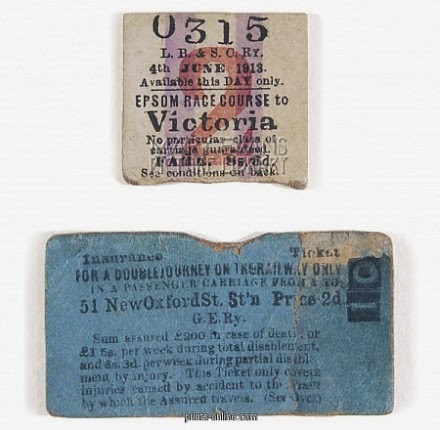 The actual ticket is in the collection of the Women's Library which was in the process of moving from its historic home in Aldgate to LSE amid some controversy Future of Women's Library but I did not have to visit it to view the historic ticket. It was there for me to see - on the internet. I'm a fiction writer, and although historical accuracy is vital and I'm meticulous in checking my facts I'm not necessarily looking for the same information as a writer of non fiction. I do visit libraries to consult books and archives on occasion but it is not always necessary for me to do so. In this case, I just wanted to see the ticket. And there it was. Emily Wilding Davison's dramatic intervention in the 1913 Derby was recorded by newspaper photographers there to report on the race and also by a novel form of news reporting: the pathe newsreel. 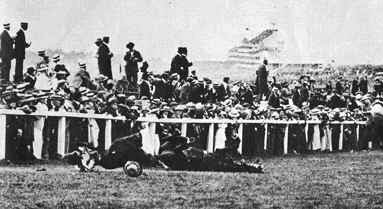 The cameras were there to record Derby Day, Emily Davison's intervention in the race was recorded by accident. The viewing is chilling. The short clip shows the build up to the race, crowds arriving, the race course itself, the runners, the start of the race, but all the time the viewer knows what's coming. I viewed the footage over and over again, not just to see frame by frame what happened, but to see everything else: the people, the vehicles, the course, the stands, the horses; details that add to my palette, help to give the scene immediacy, make it convincing and vivid and add that trace of deja vu dread, of disaster about to happen. Without the internet, I doubt that I'd have been able to see the film, or the dramatic newspaper coverage, so describing it convincingly and with accuracy would have been that much more difficult. Not everything you find makes its way into a story. 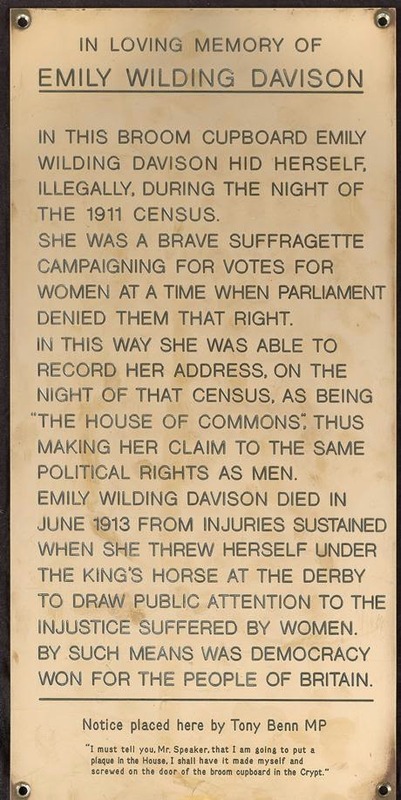 Emily Wilding Davison also hid in a broom cupboard in the House of Commons during the night of the 1911 Census. An event recorded on this plaque by Tony Benn M.P. Tony Benn died last week and with his passing, we have lost a man of great principle, one who did not forget the sacrifice of others and carried on the fight for the rights of all. Really enjoyed this story - I had heard a radio documentary about her a few months ago. Good to hear an individual suffragette story - usually you just hear about them en masse, their aims and tactics and so on: it's interesting to hear more about the characters behind the extreme acts. Whoops, ignore the "theatre" bit, it's my iPad's prediction software! It's wonderful she's getting her moment in the spotlight - and for great reasons. I watched Clare Balding's reassessment of her 'throwing herself under the King's horse' progamme on TV a few months ago (no idea if it's still on iPlayer), and she concluded that what Emily Wilding Davison was trying to do what attach suffragette colours to the King's horse - so it would cross the line dressed in purple and green. Clare Balding concluded that she never intended to kill herself. I have seen that broom cupboard! I was fortunate to have a guided tour of the houses of parliament by one of the ushers who's a friend, and he made a point of showing me! I agree wholeheartedly re Tony Benn by the way. I'm really jealous of the broom cupboard, Elizabeth. I heard the Clare Balding programme, too, Jo, but don't agree with her conclusion. I think its odd, especially as she's a racing correspondent. Anyone who has seen horses at gallop would know that such a thing was impossible. Emily Wilding Davison was a highly intelligent woman and knew about horses. I'm pretty sure she would have known she would likely not survive the intervention she planned. I'm completely undecided about whether Emily Davidson intended to kill herself or not - and have the greatest admiration for her either way. But the ticket does puzzle me. If she set out knowing that she was going to end the day seriously injured if not dead, why did she buy a return ticket? Isn't that a fabulous act by Tony Benn! I'd never known. There! The things you learn with the History Girls. Thanks, Leslie. I think our stories go well together. As for did she, didn't she, Sue, I think she did. Maybe she bought a return so as not to draw attention, who'd buy a single to Epsom? Maybe that's what she was offered and she didn't care. It was a brave act, either way, as you say. This was a woman who believed in militant, sometimes violent protest. She was jailed repeatedly, went on hunger strike and was force fed 49 times. She once threw herself down a flight of prison stairs in protest. She was determined, brave and creative. The Derby protest was not suicide, but she must have understood and accepted the risks. That damn ticket is so intriguing, but the event absolutely fits with her history and character. I love the story Celia, and will be buying a copy of the book for my girls. We'll never know, will we? She certainly was an intriguing and single minded woman, Clare. Determined to the point of fanaticism. There are some great stories there - I hope they enjoy the book. Super! And now that her plaque in the Commons has been highlighted by Tony Benn's death, she's even more in the news. THE BOOK OF BOSSY GIRLS? By Penny Dolan.